We know that our oceans play a critical role in assuring human wellbeing, providing food, livelihoods and recreation as well as helping to regulate global climates. We also know that our oceans are in trouble, with many marine species headed for extinction. 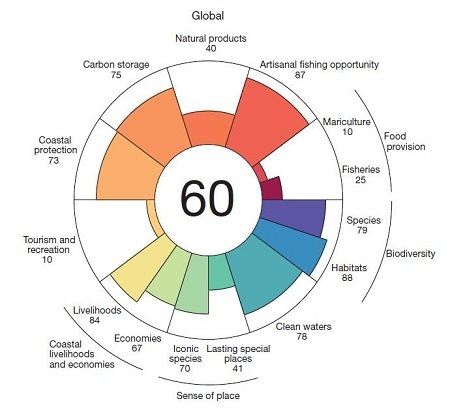 Ocean acidification, rising sea temperatures, rising sea levels, hypoxia, overuse of marine resources and pollution rank among the greatest challenges. All of these are well-discussed in a Stockholm Environment Institute study, Valuing the Ocean, which makes an important argument for valuing and protecting ocean services. But how do we gauge the health of our oceans and marine resources – a daunting task given the many interlinked and complex benefits and threats? Recently responding to this question, a broad group of marine conservationists and scientists released the Ocean Health Index,which is a sort of marine GDP, reflecting the health of our marine environments and how sustainably we are using them. An account of the Index was published in the Aug. 30th issue of Nature. The groundbreaking tool is not just a measure of how pristine the waters of any country might be, but rather considers how we humans benefit from our marine ecosystems and how our oceans are faring globally in terms of provision of services to us. In search of baseline measures, scientists and marine experts calculated standards for the many ways we use the ocean. It comprises ten goals for a healthy human–ocean system in the waters of a country’s exclusive economic zone, which usually stretch 200 mile offshore. The index now offers hard numbers to show how close or far each coastal country is to balanced use of the Big Blue. Globally, the overall index score was 60 out of 100, with developed countries largely performing better than developing countries. Only 5% of countries scored higher than 70, while 32% scored lower than 50. Rather predictably, while northern European countries tended to score highly, much of West Africa, for example, did not score so well. Researchers hope the Ocean Health Index will build awareness of the state of the world’s ocean, and work as a catalyst and guide for business and government decision-makers to develop effective policies promoting ocean health. Researchers intend to release an updated version annually that responds to new data that will overtime refine the index. The Ocean Health Index was developed with the contributions of more than 65 ocean experts including the National Center for Ecological Analysis and the Synthesis and the University of British Columbia’s Sea Around Us project. Founding partners are Conservation International, The National Geographic Society and The New England Aquarium.